Space germs wipe out virtually everyone who has passed through puberty. Abby Leigh is looking forward to watching the moon turn purple. For months, astronomers have been predicting that Earth will pass through the tail of a comet. They say that people will see colorful sunsets and, best of all, a purple moon. On a small island off the coast of Maine, Abby must help her brother and baby sister survive in this new world, but all the while she has a ticking time bomb inside of her — adolescence. Our inaugural year has been a whirlwind. We’ve review 23 independent and small press published books, conducted various author interviews, and we reviewed genres from horror to historical romance. Both Cate and I have been introduced to author’s we never would have read without this blog, and I’ll admit some of them I’ll be following in the future. I suspect a few of them will have some successful careers. The Indies format has also changed over the course of 2012, as we found that our original structure wouldn’t hold up to the demands of the days of our lives :). Who knew you couldn’t read all day, every day. I’ve been living in denial and repressing rage. That daily life caused a few posting delays and some other hiccups, but in all we were pleased with our turnout. Our big thanks our to the authors who’ve let us review, the readers who’ve stopped by to check out what we think, and the overall support we’ve received from the independent and small press industry; including other blogs who’ve referred readers, re-tweeted info, and spread the word about our reviewing prowess (my ego needs a bit of boost). Now 2013 which, will be awesome…awesome! *in the tone of Darth Maul* we’ve got big plans. First and foremost we’ve added a new review, the wonderful Aussie awesome Mari Dunham. She’s an import, but we thought opinions across the pond would be wonderful. Next we’re sticking to our 1 person review format which means instead of 2 you’ll get 3 reviews each month. Not to overdo things, but in week 4 of each month we’ll be bringing back some of our author’s we reviewed last year for guest posts to discuss various things about what interests them and their personal writing journey’s. You can learn a lot from the experience of others, and we encourage readers to drop by because there will also be free book giveaways. I love books, but even better is free books. The New Year is upon us, before we get to that we must revel in the joy that is Christmas. To those who celebrate Merry Christmas. For those who observe other practices may you have a wonderful holiday season full of joy, good food, and good company. ‘Till the new year dear readers and since we all lived hopefully that means things are looking up! For starters I will probably never take a bite out of a chocolate zucchini muffin, just in case. For second’s this book made me squint at times because I couldn’t believe the main character. Ruby Russell accidentally kills her lying, cheating husband after baking all night and getting a bit tipsy. Her genius plan involves some performance enhancing laced chocolate mousse. Instead of a painful stiffy her husband just becomes a stiff. From there it’s one painful accident after another with Ruby’s best friend, Charlotte, along for the ride. Add in a snoopy Pentecostal Preacher, a screwy reporter aiming for a way to the top, a son who just wants to marry his love and keep his mother happy, a therapist determined to prove Ruby’s hiding something in the beans, and everyone’s running circles while Ruby’s just trying to be nice. I giggled a few times, but more often I found myself doing a head slap at how things could get worse; at least the first ¼ of the book. After that I found myself more and more unable to relate to Ruby. She was mean, selfish, childish, and at times a little wacko. Then she would turn around and do something so normal and intelligent that left me with a jaw hanging open. The same could be said for her friend Charlotte. As to the explanations for these 2 crazies there were some, but I still felt a few too many holes were present. Also, I couldn’t feel sympathy for a woman who seemed to be infatuated with her son, on some small level. She doesn’t want him to experience life without her, on any level, and it’s evident by her actions. Instead of feeling smothered, Michael feels sorry for his mother instead and insists on trying to be respectful and as helpful as he can while still maintaining his freedom. Michael is probably the most endearing character for me and I love how even when everything falls to pieces and he’s finally clued in he still sticks by his family. Dialogue is good, the story flows pretty well, but if you’re not a fan of head hopping then this may not be for you. Lindsey does a lot of head hopping during the second ½ of the book, and luckily I was able to keep up. Overall, if you like mysteries with chaotic neutrals and women who have internal dialogue that snarks and gives in to the insane housewife in all of us, Death by Chocolate might be for you. Ruby Russell has reached her limit. When she discovers her hipster husband has a dirty little secret, she whips him up a Viagra-infused-chocolate mousse punishment, but in the morning, her husband’s a stiff. Armed with a lifetime of crime show reruns and Arsenic and Old Lace on DVD, Ruby and her best friend Charlotte try to lay low until after Ruby’s son’s wedding, but a nosy therapist, meddling minister and local news reporter are making it very difficult to get away with murder. This week, A Satan Carol author Alan S. Kessler joins me for an interview! 1. 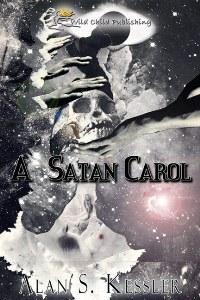 You describe A Satan Carol as a spiritual horror story for secular readers. What made you approach your story that way, or did it write itself? I don’t believe in wasting blood. When I use horror in a story I feel it should intensify the reader’s experience and by this reinforce the story’s themes which are, hopefully, spiritual–a recognition that we are more than corporeal existence. In A Satan Carol I explore the idea of free will with a spiritual being, Satan, who has motivations that are human: he feels unloved and abandoned. If we understand him in his demonic form we have greater insight into our own yearnings and mistakes and from this might feel, for a moment, uplifted. Perhaps that’s all a writer can strive for, to give his reader not lasting impact but an instant of clarity. 2. Mr. Green seems like a larger-than-life character. Did you intend for your devil to be so boisterous, or was that more of a surprise? He began to speak for himself. I experienced the fun of him taking over and saying what he felt. 3. I liked your choice of not going “mainstream-Christian,” using Mormon beliefs to shape your characters and the plot. Was this choice a result of any personal experience with Mormonism or research? Thank you for this question. The novel has received a number of reviews but you are the first to see the book’s connection to LDS beliefs. I am an inactive member of the church attracted to its very complex theology that I find fascinating and rich in spiritual meaning adaptable to my kind of story telling. 4. What was the most bizarre item you came across during researching for your novel? Not necessarily bizarre but interesting. Our concept of the devil is post-biblical, a creation of the middle ages. Thus I felt free to give Mr. Green the personality he wanted. 5. What’s next for Alan Kessler? Shadowland, hopefully out in 2013. It is the story of a boy coming of age in a house of demons–human ones. This is horror without slash and drool, more terrifying, I believe, than the monsters who lurk only in the shadows of our mind. For more information on Alan S. Kessler and his upcoming projects, check out his website here. I have to start out by saying that this is one of the most bizarre books I’ve read in a long time, and that’s not necessarily a bad thing. It was that bizarreness that kept me hooked to the world Kessler has created out of the city of Boston, Scripture, prophecy, and a family Jerry Springer could use to resurrect his daytime talk show to monumental ratings. And then we have Mr. Green. The devil. The tie that binds. The one who unwillingly links the Katz family to his own demented prophecy. Mr. Green considers himself the lesser son, referring to Jesus as the golden boy, a brown-noser and quite a few other things that Satan probably would think about Christ. The book draws heavily from Mormon beliefs, never calling the religion by name and referring to it only as the Church, and that adds another depth of interest to the plot. These draws include the Mormon belief of Jesus and Satan as brothers and the ruling of another planet after death. The Katz family is…a mess. Father Harvey is a defense lawyer who has built his fortune on the backs of murderers and prefers the company of hookers to that of his wife. Wife Susan is faithful, devoted, and having an affair with Mr. Green. Daughter Katie is a sixteen-year-old Gothic rebel who’s pregnant by Harvey’s business associate (spy), Hugh Jackson. Dizzy yet? It’s truly no wonder a family like this has Mr. Green’s full attention. And yet, the one thing Mr. Green wants, the golden soul that would turn his paraplegic and mute Pal into a prophet, is on its way to melding with Katie’s child. Human nature, sin, salvation, and free will are the cornerstones of a book that highlights the worst of humanity. Within the Katz family (and their extended family), one can find each of the seven deadly sins. Probably Mr. Green is the one whose sins are the greatest, his being the devil notwithstanding. In his obsession to retrieve the golden soul for Pal, in his manipulation of the Katz family and of those whose lives intersect with theirs, he commits the most grievous sin—the revoking of free will. Mr. Green is probably the most rounded character, and in some ways he’s almost a caricature of the Satan we learned about in Sunday school. Often over the top and incredibly verbose, Mr. Green’s almost-comical interactions with those around him remind me much of Mr. Nick, the devil character in the movie The Imaginarium of Doctor Parnassus (if you haven’t seen it, shame on you; aside from being one of Heath Ledger’s last roles, it’s also an incredibly well-done movie, directed by the great Terry Gilliam). In fact, as I read Dr. Green, I imagined that devil, the one who manipulated people so easily, all of his ideas seemed to be theirs. Mr. Green makes a mockery of faith and of free will, yet in the end is undone by both. Somewhat. In the world of this book, many things, including the devil, are immortal. I would recommend this book to people who enjoy a different take on religion and Satan’s role in the spiritual world. Think a less-lofty (and slightly grosser) Memnoch the Devil by Anne Rice.